Catered Affair has always been eager to please our loyal customers. While a fair share of our customers enjoy our selection of deli favorites and fat sandwiches, we have seen an increase in customers looking for healthier lunch options. In response we have built a ‘Healthy Choices’ Menu. We’ve added a list of healthy sandwich add-ons, which includes some of nature’s finest ingredients like avocado, spinach, mixed veggies, and more! In addition, you can substitute bacon for turkey-bacon on any sandwich or egg whites for regular eggs. We offer Turkey Burgers as a healthier option for those looking to avoid red meat and our Black Bean Veggie Burger is great for any vegetarians at our shop. A coach at Hillsborough High School recently requested that we carry gluten-free wraps, as he had developed an intolerance to gluten and was no longer able to eat his favorite sandwiches at CATERED AFFAIR. The new gluten-free wraps are now available for all to enjoy. We also offer the option for ANY item in the shop prepared in “BREADLESS” fashion. Whether you’re looking for breakfast, lunch, or an early supper, CATERED AFFAIR AND SANDWICH STATION has something to satisfy your hunger. And now our menu has expanded options for health-conscious customers, vegetarians and those gluten-allergies. 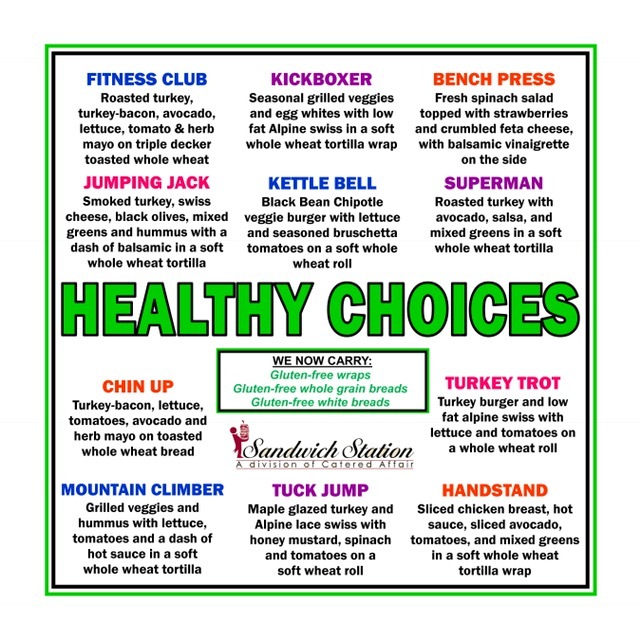 Stop by and try out our new Health Choices menu today!